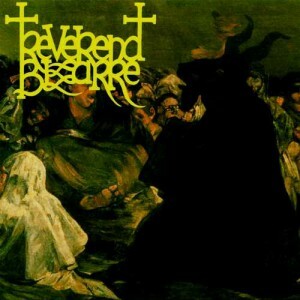 Return to the Rectory is the second EP by Reverend Bizarre. The title is an obvious throw back to their first album, In the Rectory of the Bizarre Reverend. At 66 minutes long it is hard to consider In the Rectory an EP by any stretch of the imagination. In either case the music follows the same format as In the Rectory of the Bizarre Reverend; atypical song structure, sparse guitar plods, dramatic baritone singing and a guitar tone so thick that you can almost see it. This time around the longest song is 12 minutes and Reverend Bizarre have managed to throw in a couple of new tricks to try and keep their sound fresh. This includes a lengthy acoustic guitar intro to The Festival and more mid-paced parts which sometimes become genuinely fast. This is definitely a welcome addition to their sound. The subdued keyboard sounds heard on In the Rectory of the Bizarre Reverend have been given a second chance on Return to the Rectory. While used sparingly, they do get stand out moments on For You Who Walk in the Land of the Shadows and The Wrath of the War Elephants. They work well to build up their foreboding atmosphere to make the songs stand apart that bit more. Opening song The March of the War Elephants features the usual lengthy guitar drones and some excellent drum work that makes the song promising enough in its own right. The song suddenly bursts into a full on gallop and then rapidly fades out to leave you miffed. Reverend Bizarre might have spent time throwing in more variety but it doesn’t mean much when you forget to finish your opening song. On the other hand there is strong continuity to be found elsewhere. The spares lyrics on The March of the War Elephants seem to follow into The Wrath of the War Elephants which then reprises elements of the music found in The Goddess of Doom. The dramatic baritone voice still presides over most of the song but with more enunciation while their cover of Dark Sorceress (Autumn Siege) by Barathrum makes a U-turn by extensively using the vomiting voices found in black metal. The Goddess of Doom name drops several influential and current doom metal bands with Reverend Bizarre appointing actress Christina Ricci the title of The Goddess of Doom. This at least shows that there is a sense of humour mixed in with Reverend Bizarre’s prolonged agony. When a band has all the ingredients for making great music it is hard to hear them miss the target if for nothing other than forgetting when to stop playing a song. Return to the Rectory shows a small expansion on their sound but it will most likely appeal to existing Reverend Bizarre fans before anyone else.